Everyone should have a stellar compact flashlight for everyday carry. But the truth is that most of the good ones are pretty expensive and not everyone can afford those. However, this does not mean that there are no top-notch small flashlights that are affordably priced. In fact, there are many budget-friendly portable torches that are ideal for those who do not want to spend a lot of money on a flashlight. Whether it is for your EDC gear, survival or emergency kit, etc., you can find quality compact flashlights that are priced under $50. In this article, we give you what factors you need to consider when buying a decent flashlight and also the best flashlights under $50 you can find on the market. Body: In most flashlights available on the market today, manufacturers use a form of scratch-resistant type III anodizing on the body. They also often use aerospace or aircraft grade aluminum. Expensive or cheap, this is one of the things you should look for in a flashlight. Make sure that your under-$50 flashlight has a solid body that will make it last a long time. Waterproof: Small or large, many of the flashlights available nowadays are waterproof. This means that you can immerse your flashlight in the water, usually for about 30 minutes in 1-meter deep water. Although a cheaper flashlight is unlikely to have a very good waterproof or water-resistant feature, it is still good to have it as it allows you to use it in the rain. Emitter: One of the most important parts of a flashlight is the emitter – it produces the beam of light. Most manufacturers these days use CREE emitters in LED flashlights. However, cheaper LED flashlights will probably have older generation emitters, but it is still something you should look at when buying a suitable flashlight. Brightness Levels: How many levels of brightness does your flashlight provide? This is another important feature you should consider. High-quality flashlights usually have multiple levels that provide the right amount of light you need. You may not find that many brightness levels in a cheap flashlight, but you should pick one that has the basics, including SOS which can be useful in emergency situations. Heat Dissipation: Most LED flashlights get a little hot when used on the highest setting, but high-quality, more expensive flashlights will have good heat dispersion. In cheaper ones, this heat could shorten the life of the electronics. Additionally, if the entire body gets hot, it could affect the batteries too. If you are shopping for an affordable flashlight, you should make sure that the body is well made so that the heat does not damage it too quickly. Batteries: Most cheap flashlights are powered by ordinary AA or AAA batteries. The more expensive ones often come with rechargeable batteries, etc. but they cost a lot to replace too. AA or AAA batteries are a prudent choice as they are easily available and do not cost a lot. You can buy several to keep as backup for when your flashlight runs out of juice. Brand Name: Not all cheap flashlights are made by unknown manufacturers. Many brands that make high-quality, innovative flashlights have products that are affordable too. You should choose a brand name that is known for making quality flashlights. They may not be as good as the pricier ones, but you will still obtain an outstanding flashlight that meets your needs at an affordable price. When it comes to portable flashlights, Fenix is one of the leading names, providing high-quality lights for all kinds of applications. The Fenix E12 is one of the manufacturer’s budget options and a poignant choice if you are looking for an affordable flashlight under $50 and with those amazing tax cuts, this price is even more alluring. Precision-machined from high-quality aluminum, this flashlight is well constructed and will last quite a while. It is also great for outdoor use. With a maximum output of 130 lumens, you will be surprised by how bright it is in the dark. The Fenix L12 comes with Bright and Dim lighting modes, so it is quite simple and easy to use – perfect for EDC. If you want an affordable flashlight, this is definitely one of the best choices out there. Although it is not as bright as some of the other flashlights we have used, we think that the Fenix E12 is a great buy when you are looking for an affordable light under $50. It is the ideal light for EDC. It is very easy to operate and the grip feels good in the hand. We are highly impressed by the solid construction of high-quality aluminum, especially in such a low-priced light. This flashlight is sure to last you quite a long time. If you are shopping for a cheap flashlight, we definitely recommend the Fenix E12. With a CREE LED emitter, the Anker LC90 provides bright light of up to 900 lumens with a beam distance of nearly 1,000 feet. It also has an inbuilt focusable lens that allows you to get the close-up illumination you need in some situations. The LC90 also has easy to use 5 adaptable lighting settings and up to 6 long hours of battery life. The battery can be charged via micro USB. With its IP65-rating water-resistant feature, you can use the flashlight even in heavy rain. When it comes to flashlights under $50, this is most definitely one of the top choices available today. We think that the Anker LC90 is one of the best flashlights under $50 as it comes with some features usually found in more expensive lights. We like the 5 adaptable light settings which make it convenient to use whenever you need it. The LC90 has a solid construction, ensuring that it will last quite a while. We found that it drains battery life quite fast, but it does feature micro USB recharging so you can charge it anywhere when you need to. We also think that the multi-mode tail cap could be made better. However, all in all, the Anker LC90 is an excellent affordable flashlight and we think everyone should have one, whether for EDC, outdoor trips or survival kits. Using the latest CREE XP-L V6 LED, the ThruNite TN12 gives you a maximum output of 1100 lumens. This is a compact and reliable affordable flashlight that is ideal for EDC as well as outdoor activities, law enforcement, military, security, and emergency use. The flashlight has an upgraded stainless steel side switch that makes operation simple and easy. The ThruNite TN12 also has an innovative and improved circuit design that makes the difference in brightness between Max and High modes more obvious, and a centralized LED bulb to provide better beam focus. When it comes to affordable flashlights, the ThruNite TN12 is one of the best designed and constructed, making it a terrific buy. The ThruNite TN12 is an amazing compact flashlight that is bright, reliable and durable. It works very well, so we think that it will make a great flashlight for EDC and other applications. With a solid construction, it feels good in the hand and will definitely last a long time. The only negative we found is that the beam is not adjustable. The ThruNite TN12 performs well every time you need it to and it is easy to use and carry. 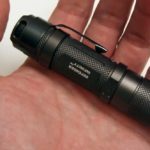 When it comes to affordable flashlights priced under $50, we think that the ThruNite TN12 is one of the best ones available today. Also check: The 10 Best Rechargeable LED Flashlights: No Batteries? No Problem! The Streamlight PolyTac 88850 is a cool-looking affordable flashlight that uses C4 LED technology. It is impervious to shock and features a Borofloat glass lens. With the tail cap push button, you can easily operate the light with one hand for constant or momentary on. The Streamlight PolyTac 88850 also features a TEN-TAP programmable tail-switch that allows you to select one of the three different programs. The parabolic reflector produces a concentrated beam with excellent peripheral illumination. If you are looking for a high-quality, affordable flashlight that is feature-rich and built to last, you should check out the Streamlight PolyTac 88850. The Streamlight PolyTac 88850 is one of the top flashlights under $50 because it has some great technology and features in it. It is easy to use and provides super-bright light. It looks great and feels comfortable to hold as well. We had some difficulty removing the clip, but this is not a big deal unless you really need to get rid of that clip. The Streamlight PolyTac 88850 is solid and sturdy. Since it is impervious to shock, you can use it even in rough conditions. This is an awesome flashlight for the money. We definitely recommend the Streamlight PolyTac 88850 to anyone looking for a quality flashlight under $50. (+) Compact enough to carry in pockets, purses, etc. If you are looking for the ultimate bang for your buck, the J5 Tactical V1-Pro is for you. Offering an output of 300 lumens, it is bright and also provides three interchangeable modes for you to switch between with ease. The J5 Tactical V1-Pro may be compact but it is tough and performs very well under any condition. You can easily fit it into your pocket, purse or backpack. Virtually indestructible, you can drop it from 9 feet and it will still work. It is also water resistant, making it ideal for use in rain and snow. If you are looking for an affordable flashlight that gives you peace of mind and sterling value, you should flip the switch for the J5 Tactical V1-Pro. Tough and rugged, the J5 Tactical V1-Pro is the perfect flashlight for EDC, outdoor activities, emergencies, etc. No matter where you are, you can rely on this affordable flashlight to give you great illumination every time. We like that it can be used in rain and snow and yes it can be used to find that amazing Transformers DVD copy you dropped on the ground inadvertently. It is bright with great beam distribution. The J5 Tactical V1-Pro does not have many issues – the only one we found is the length of the small section under the clip. If it was longer, it would make using a mount for a weapon easier. Nonetheless, we think that the J5 Tactical V1-Pro is an excellent product with great value for money. The SureFire G2X comes with a virtually indestructible LED emitter that is regulated to maximize light output and runtime. This is a well-designed low-priced flashlight that has a single high output level of 320 lumens, giving you super-bright light when you need it most. Compact and lightweight, the SureFire G2X is perfect for EDC as well as outdoor trips, emergencies, etc. It also features a tactical tail cap switch and precision reflector that gives you a very smooth and optimized beam. Made of high-quality materials to ensure performance and durability, the SureFire G2X is a great flashlight for under $50. The SureFire G2X is one of the best flashlights under $50 that we have used. It is easy to operate and works reliably. Although the light is not that bright, it does get the job done. The solid build is impressive and it ensures that this flashlight will be durable. We also liked the dual settings very much. And yes, this amazing device can help you find that stellar coin that you just dropped on the ground. It is lightweight and compact, which is great when you want to carry it everywhere you go. If you are looking for a tough low-priced flashlight that is made of quality materials, you will love the SureFire G2X. It is sure to provide reliable light whenever you need it, no matter where you are. Using the latest CREE XP-L2 LED, the ThorFire VG10 is an extremely bright flashlight, providing a maximum output of 1100 lumens. It can give you an intense beam of light up to 900 feet. It comes with versatile modes with memory, ensuring that you have the illumination you need no matter what the situation. Made of aircraft-grade aluminum, the ThorFire VG10 is waterproof to IPX-8 standard, making it great for all types of weather. Over the course of 15 minutes, it will go down from high to medium modes if you leave it on for more than 5 minutes – this prevents overheating. The ThorFire VG10 is an affordable flashlight that has some fantastic features to make it functional and reliable. When it comes to inexpensive flashlights, the ThorFire VG10 is one that has many great features, making it functional and ideal for all types of applications. It gives off very bright light that is perfect for when you are in dark places, whether indoors or outdoors. For sure, this lighting tool can be used to find your wireless computer mouse that just fell somewhere under your desk. Another thing we really like about the ThorFire VG10 is that it has a great fit and finish. Easy to use, this affordable flashlight under $50 is definitely a must-have whether you need a light for EDC, outdoor trips, emergencies, security, law enforcement, etc. Weather resistant and impact resistant, the Coast PX1 is a high-performance flashlight with an LED that is virtually indestructible. The flashlight has an innovative feature – pure beam focusing optic with twist focus so you can adjust the type of beam you want for your situation. With the twist focus, you can shape the beam of your flashlight from Flood to Spot by simply twisting the head. The reversible pocket clip makes the Coast PX1 versatile to use – you can secure it in your pocket or attach it to the bill of a hat. No matter what application you have in mind, the Coast PX1 is one of the top flashlights available at a low price. We think that the Coast PX1 is one of the most well-made inexpensive flashlights today. The beam focusing optic feature is handy as it allows you to adjust the beam focus depending on your needs. The size is also perfect as you can carry the light in your pocket, purse, backpack, etc., basically, everywhere you go. And for those of you who have pets, this device can be used to find your cat who likes to fall asleep on top of the refrigerator. The light that this compact flashlight emits is incredibly bright, ensuring that you have reliable illumination whenever you need it. We think that the reversible clip could be improved, but other than that, there are no complaints. If you are looking for a flashlight under $50, we definitely recommend the Coast PX1. The TerraLUX LightStar 300 is a 300-lumen aluminum flashlight that comes with a recessed tail cap switch with two brightness levels. It features versatile beam patterns – uniform light, wide spill, etc. and has less of a hot spot when compared to other flashlights. The TerraLUX LightStar 300 is o-ring sealed to give it resistance to water and has been drop-tested for durability. It comes with a pocket clip and wrist strap so that you can carry your flashlight anyway you want. 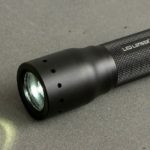 The TerraLUX LightStar 300 is a great choice if you are looking for a reliable flashlight that you can buy for under $50. The TerraLUX LightStar 300 is awesome as you get intensely bright light from a small package. We think that it is great for EDC and work. This inexpensive flashlight is very well designed and is constructed with high-quality material to ensure ruggedness and durability. It works well under all types of conditions. Some may find the TerraLUX LightStar 300 a little too light, we think that it is pretty good. No worries, if you forget where the switch is on your remote control so you can turn on The Good Wife, House of Cards, or 24, this flashlight will come through for you. While it may not have features that tactical lights have, it is still functional and very versatile. If you need a flashlight that is bright and easy to use without spending a lot of money, we recommend the TerraLUX LightStar 300. When it comes to illumination, Olight is one of the most trusted names as they make outstanding products. The Olight S MINI Baton is one of them. This neat-looking flashlight uses CREE XMa-L2 LED that is combined with TIR optic lens. 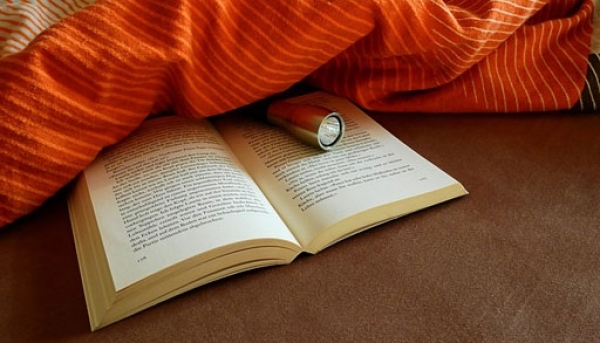 It features gradual brightness change, which means that when you turn the light On or Off, the light will gradually fade On/Off so that your eyes do not get strained during brightness changes. The Olight S MINI Baton also has PVD processing which makes the light highly corrosion or scratch resistant. If you want an affordable flashlight that works well and lasts long, you should go for the Olight S MINI Baton. When you need a reliable source of light, you should go for the Olight S MINI Baton. We think it has quite a few things that make it one of the top under-$50 flashlights around. The PVD processing that makes the light corrosion and scratch resistant is excellent as it means that rough use will not cause damage. We also like gradual brightness change that prevents the eyes from getting hurt. Bright and sturdy, the Olight S MINI Baton is a superb compact light to have, whether for EDC, outdoor trips or work application. We definitely recommend this nifty little light to anyone looking for an affordable flashlight. Everyone should have a compact flashlight that they can rely on when they need a source of light in a dark place. Whether it is for security or finding things in the dark, having a small light can be extremely helpful as you never know when you might need it. There are countless top-notch flashlights with innovative designs on the market, but most of them are pricey even in this market that is rising because of tax cuts, so not everyone can afford them. However, if you do a little research, you will find that there are many flashlights under $50 that meet your needs perfectly. The ones mentioned above can give you an idea of what to look for so you can buy the perfect affordable flashlight for your needs. The 10 Best Rechargeable LED Flashlights: No Batteries? No Problem!